Comment: No it's not the Onion.com, but "Business Insider." An arcane idea that started on finance blogs in the summer of 2011-- that Tim Geithner should mint a trillion dollar platinum coin to avert the debt ceiling -- is now seriously taking off. 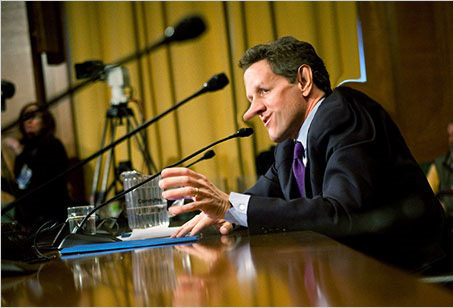 The premise of the idea is this: Although the Treasury can't just create money out of thin air to pay its bills, there is a technicality in the law that says the Treasury has special discretion to create platinum coins of any denomination, and the thinking is that Tim Geithner could make the coin and walk it over to the Federal Reserve and deposit it in the Treasury's bank account. The first blog to really promote the idea was Cullen Roche's Pragmatic Capitalist. We jumped on it soon thereafter, as did others. Of course, once the debt ceiling was solved, people forgot about it. But there's a new debt ceiling looming, and this time, LOTS more people are talking about it. We noted our surprise back in early December that an actual 3rd party research firm brought up the idea. Now it's going even more viral. Paul Krugman discussed it yesterday. In an interview with Capitol New York, Representative Jerry Nadler came out in favor of the solution (Nadler has an above-average understanding of economics in our experience). Josh Barro at Bloomberg is now endorsing it, and that's spread a huge conversation about it among DC journalists and policy folks on twitter. And yet the same revolutionary beliefs for which our forebears fought are still at issue around the globeâ€”the belief that the rights of man come not from the generosity of the state, but from the hand of God. This was so.......it's so ridiculous I'm writing this guy a letter. How much would be the weight of this coin ? The article simply says "Treasury has special discretion to create platinum coins of any denomination, and the thinking is that Tim Geithner could make the coin and walk it over to the Federal Reserve and deposit it in the Treasury's bank account." It could be an ounce or more just to speculate. This is scheme is the very definition of insanity. Don't let them fool you. THE US CREATES MONEY OUT OF NOTHING TO PAY THEIR BILLS EVERY DAY. According to Jerome Corsi, the Fed is buying back $85 billion of debt each month. How? By printing money out of thin air. WHERE DID THE $23.7 TRILLION COME FROM THAT THE BANKERS TOOK BACK IN 2007-2008? OUT OF THIN AIR---ACCOUNTING DONE BY CROOKS WITH COMPUTERS. And if they make these coins, who will get to buy them? The slaves or the bankers? You got it-- the bankers. They will get platinum and the US government will get paper money for the platinum. ANOTHER DAY IN AMERICA. ANOTHER SCHEME. How long can Tiny Tim Geither's nose get? We know the truth that they print money out of thin air in the first place, I wrote a letter but I stayed simple and tried to get to the bottom line without going into specifics. I will see what his answer will be. Here is the letter. "In response to you're article "Update: Suddenly, Lots of Influential People are talking about the Trillion Dollar Coin Idea to Save The Economy." The Federal Reserve doesn't hardly answer to anyone and when they do, they are let off the hook or avoid questions. My question to you is this.....why did you write such a false document, it ruins your credibility, along with the news outlet you work for. This is why so many people are going to alternative media.Geithner is in the Foreign bankers back pocket. He does what he is told, but he has a choice...just like you. If you are Ok with our Country going into debt due to taxes that just fund more and more programs and is never used to alleviate the debt, then be my guest. WE THE PEOPLE will not stand up for it. P.S. Feel free to let me know how you are going to fix your mistake as you already have harmed enough people spreading this gob of words that I could print out and use as toilet paper. You are better than that, write something that you know will make a difference and be for a noble cause instead of disinformation and Government Counter Intel." My letter was very tame in comparison to what it could be. That being said, at least I wrote him, we all need to start writing these journalists because that's where the sheeple get their information before they put their votes in. If I hear back from him I will send that too. Weisenthal wrote the article. Check out who the CEO of BI is and his past. The site editors vary greatly in background. Henry Blodget is the CEO and Editor-In-Chief, a Yale graduate who previously worked on Wall Street before being barred from the securities industry after a conviction for securities fraud. Deputy editor Joe Weisenthal has worked as an analyst and writer for a series of dotcoms. Deputy editor Nicholas Carlson previously worked at Internet.com and Gawker Media's Silicon Valley gossip blog, Valleywag.com. Now people will recognize it only represents VALUE, not HAVING the value itself. Then people wonder where the value it represents is, and how we can say this thing over here is worth that thing over there. The bankers have said "Nee!, MY paper is worth YOUR gold! olookawolf!wolfwolfwolf!" one too many times. Ok, so he is a crook, just like we all knew. Human nature, they held out their best for last $ MONEY, Put aside the conscience factor nationally, forget the genociding, torture, 911, FF's, freedoms, or the hundred of thousands slaughtered have anything to do with this, forget about it! But mention money , an eye opens, say it again, both eyes are wide open. But hey, it's OK, the ole Gov will take care of us, they have solutions, FEMA camps a hot and a cot, get in the boots same deal but w/ pay, a job with the DHS/TSA, or unite as one sovereign nation of Americans and get rid of the rat bastards. Afterall, peace is prosperity we haven't had any for over a decade. The MSM may hit on the upcoming invasion of Syria, but will they on Iraq, Afg, Somolia, Libya. etc. More people talking as if it were a good idea. At the same time they are talking about moving the retirement age to 68 on their video. At the same time they do not mention, eugenicists get their euthanasia as they have in the UK, to rob an entire lifetime of social security even more. I'm off the map on this. I have seen people fighting over scraps to eat, getting real ugly, down and dirty. memory: A guy I know was showing off his new sports car , I told him it was nice, but asked him if he could eat it. Needless to say I had to explain to him all our toys are nice, but one day there will be no food around and by God you can't eat that car. Oddly enough we had an adult conversation and he got my drift. This was years passed, I heard he sold the car and his big house, moved to a more humble area and has no debt whatsoever, I'm not trying to say it was me who initiated this change, he just got a grip on reality. This crew of rats running the takedown have been at it for generations, I am of the belief we have scratched the surface of their ability on this site, I'm with the feeling they have only shown us a few of their cards, they have much more instore for us. While most folks have been out working and providing for their familys, keeping food on the table and bills paid they have been 24/7/365 hard at work with this global meltdown. In short there is no magic solution to this abomination. The constitution was our sheild , they have attacked and disqraced. They are not to be underestimated. Buckle up. At the moment, it is the Federal Reserve Bank â€œrunning the printing pressâ€� creating money, which the Treasury / politicians then borrow. We would be better off (if that phrase can apply to the situation) if it was the Treasury creating the new money via a means such as a platinum coin. Consider an example, the Federal Reserve Bank (a private bank owned by who know who, since they will not tell Congress) creates money, which the Treasury borrows, issuing a $1 million note to the â€œFEDâ€� (private bank). The politicians then spend the million of new â€œcashâ€�. The FED trades the treasury note for real estate. When our federal politicians borrow new money into existence, there is TWICE as much inflation as there would be if they just created a coin and spent based on it. Trillion dollar coins, and money based on them, spent into the economy would be LESS inflationary than borrowing, and to the extent they are used to pay-off existing debt, would be DEFLATIONARY. could a mod graft the other post? The campaign to get around the debt ceiling by using a Trillion Dollar Platinum Coin has reached a new level of intensity today. To take a step back, the US is about to hit the debt ceiling, at which point it will be illegal to issue more debt to fund the government, unless the Congress agrees to hike it. In the past, hiking the debt ceiling was pretty painless, but some in the GOP are staunchly opposed, raising the spectre that the US will default on its obligations. It's because of this, that people are getting more and more excited about the Platinum Option, which refers to a technical loophole in the law that allows the Treasury to create platinum coins in any denomination, theoretically up to a trillion and beyond. Earlier today, Paul Krugman hopped on board and said Obama must be ready to mint the coin if the GOP goes to the matt). My apoligies, I was not taking this seriously. Just what the Globalists want. The next time you encounter a federal civil service employee, walk up to them, and say â€œThank youâ€�. As of 31 DEC 2012, in essence, it is the (former) funds in federal civil service employee pension and TSP (401k equivalent) that is being spent by your politicians. These States had better have theior currency contingency plan in place. When I was a kid confederate money was being sold, tons of it, this was in the early 50's. friends were decorating their walls with it. I can't say who got their hands on it, but it was the real thing. If I had a few pounds of this confederate $ today I have 10 times the value of the dollars worth per note. Sorry to go off the map, this whole issue is about bankrupting this nation, bringing it down, dividing it , creation of domestic violence leading to global intervention & the NWO hammer of controll. I keep thinking about the U.N assembly when Powell stood behind the podium and gave his speal about WMD's in Iraq, whats wrong with that scenario, did all the UN reps beleive this guy, NOPE, it was all part of the elites takeover leading to the finality of this nations base. These freaksters have been into this end game for many decades. Good men (public figures) who have stood up to them have either been killed or ignored, whistle blowers have been suicided & the silent majority has remained *silent.